Northern Tablelands MP Adam Marshall, centre, with Pallamallawa Sportsground Trust members Phillip Tonkin, left, Shelley Johnstone, Les Rigby and Lynette Taunton at the sportsground to announce the $134,000 boost. 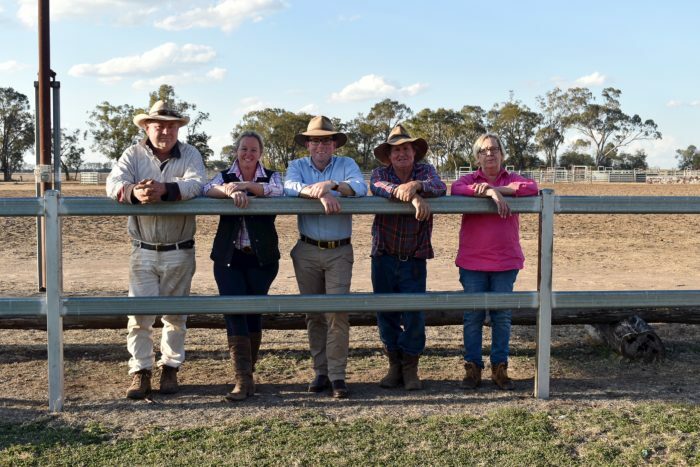 NORTHERN Tablelands MP Adam Marshall has announced a $134,000 grant from the NSW Government for the Pallamallawa Sportsground Trust to construct some new horse yards and equine user infrastructure. Mr Marshall said the funding would allow the members to build 80 new horse yards, a steward’s office building and new bench seats for more spectators at the Pally sports and recreation reserve. “This $134,000 will provide for some essential upgrades to the equine facilities that the Pallamallawa community will all benefit from,” Mr Marshall said. “The reserve grounds there are about 100 years old and these works will not only improve the safety standards but also the amenity of the facility for everyone who uses it or goes there to watch or participate in events. “This project will see compliance with Polocrosse Association of Australia standards and will ensure Pallamallawa Sport and Recreational Grounds can be a high quality public equestrian facility. Pallamallawa Polocrosse member Shelley Johnstone said the Trust that manages the grounds and all sports users was very excited about the funding and what it will bring. “It’s great news for all of us and for Pally itself,” Mrs Johnstone said. “We’re so fortunate in getting this grant because there are so many user groups who use the facility. It’s a central place for sport and recreation absolutely. Mr Marshall said the Trust and other groups really wanted to promote the grounds to even more prospective users. “It is a significant player when it comes to horse and other sports and the plans for the funding and the project itself speaks miles about the get-up-and-go attitude of the community,” Mr Marshall said. “It’s used for polocrosse, camp drafting, team penning, equine training days, mud trials, even the local school holds cross country events there and bike riders, runners and other exercise groups also take advantage of what that space has to offer. “The project will build on that reputation but also improve the facilities and upgrade the safety aspects for both stock and humans. “The existing yards are not as safe as they should be but the new ones will have swinging gates and be very secure for all horse sports and importantly will give the ground more capacity to hold bigger carnivals and events. The Pally project also includes plans to retrofit about 40 shipping containers to provide a stewards office, commentary box and events organisers’ spaces. “The new bench seating will be a virtual grandstand on skids that can be moved for different events and provide for about 150 spectators,” Mr Marshall said.